Sam opened the doors to his pizza shop for the first time back in 1991, when he was just 18 years old. It was his dream to serve the best pizza to Buckhannon, WV and the surrounding community. Now, Sam continues to give back to the community by not only providing delicious pizza, but by also supporting local businesses, youth and teen sports teams, and community events. 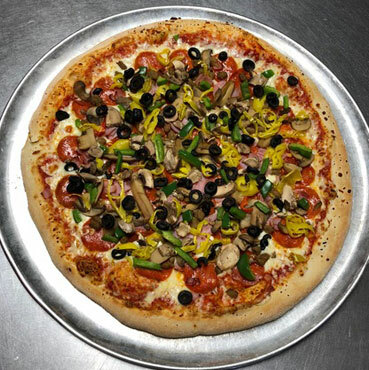 Our customers love our restaurant’s connection to the community and our reasonable prices for our fresh, delicious pizza. In addition to our regular dough, we offer gluten-free pizza dough that is perfect for those with sensitivities and allergies. Try it with any of Sam’s delicious pizzas! Stop by Sam’s Pizza today and dine in our family-friendly atmosphere, or order your meal for take-out or delivery: (304) 472-0281. Take advantage of Sam’s pizza buffet and get all-you-can-eat of the best pizza in town. Our buffet opens for lunch and is available until 9:00 p.m., so there is plenty of time to come in and get your fill of Buckhannon’s favorite pizza. If you do not see your favorite pie on the buffet, let our staff know, and we will do our best to get it on the buffet soon. Our pizza buffet is perfect for when you want more than one style of pizza, but do not want to pay the price to purchase multiple pies. We also offer a well-stocked salad bar that you can take advantage of either on its own, or in addition to our pizza buffet. Stop by our restaurant and check out our buffets today! At Sam’s Pizza, our entire menu is available for ordering. Stop by the restaurant and pick up your order on your way home, or choose our convenient delivery option and get your whole meal delivered to your home or business. Whether you crave our specialty pies, calzones, subs, salads, or something else entirely, you can get your favorite dishes from Sam’s for take-out or delivery. Call us today at (304) 472-0281 to place your order, or take advantage of our convenient online ordering.